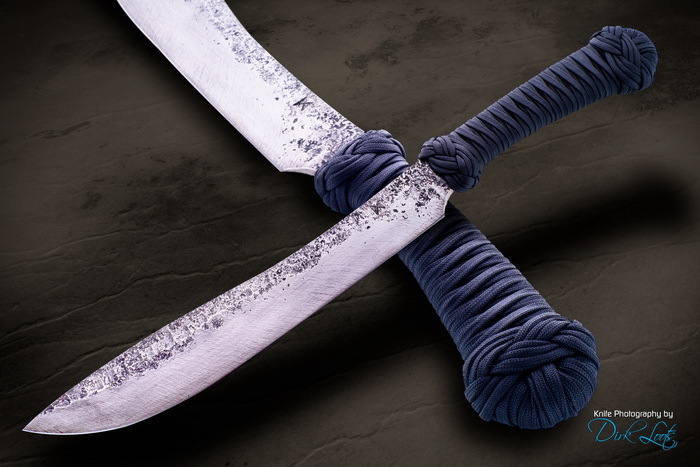 **** Chosen by Winner: Kenneth W.
Forged in Fire Champion James Helm's Short Bush Sword features a 13-inch blade of his signature forge finished 80CrV2 high-carbon steel that has been triple normalized and triple tempered. Overall length is 23 inches. The bolster and handle is Helm's signature parachute cord, black over Olive Drab, wrap soaked in marine epoxy with a slab of neoprene underneath the cord wrap on each side of the tang for a better shape to the grip area. The sheath is thermaformed Boltaron acrylic/PVC alloy. I became interested in blacksmithing around age 15. I began researching the subject in the books I could find in the public library of my home town and on Internet discussion forums. At age 16 I got a Little Rivet forge and a small amount of coal and I started pounding iron. Among other jobs, I have had the opportunity to work for three metal artist shops in Lubbock and San Antonio, Texas. 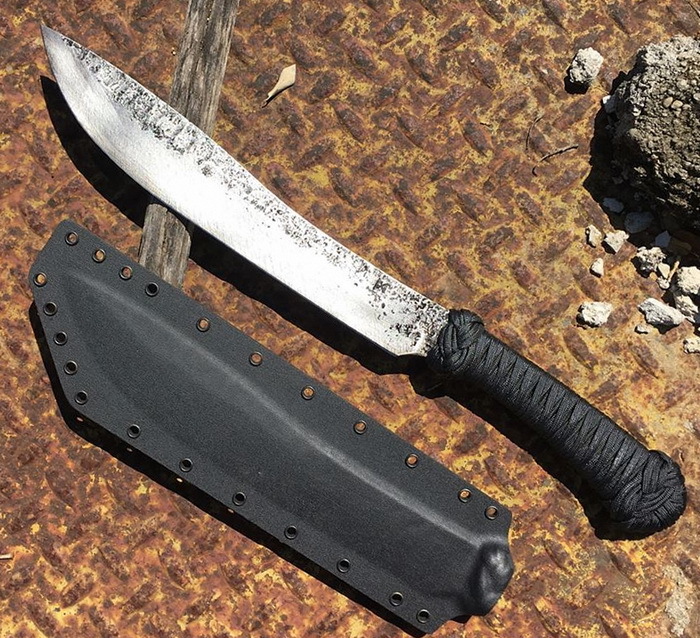 I put together a small gas forge and started producing knives for sale in my off hours, working in my employers’ shops and moving my forge as much out of the way as I could when finished. Finally, the chance came to rent my own work space and begin my own business. My father was a farmer and owner/operator heavy haul truck driver. Whenever he was contemplating some undertaking, whether custom hay baling or trucking, it was always under the name Helm Enterprises. Perhaps not officially, but it was how he thought of it. So, as a nod to him and his incalculable influence on my life, I have named my business Helm Enterprises, Forging Division. James is a Forged In Fire Champion, Season 4, Episode 3. To the winner of my knife: Thank you for supporting Knife Rights in their vigilance to protect our Second Ammendment and the right it guarantees.